F or a press that President Trump regularly complains of, you do not believe that the editors would try to show these virtues themselves. Early Wednesday morning, the day after Christmas, President and First Lady Melania Trump arrived in Iraq and surprised the American troops with a personal visit. The President was cheered and applauded as he went on stage talking to service members who were stationed far from home. After his remarks, he shook his hand, posed for selfies and signed autographs for respondents. It was a beautiful episode that the troops clearly appreciated and enjoyed. It would take a hard, graceful heart to criticize the President's surprise visit for something he was to criticize. It would be a worrying cold partisan to look for the eager service members who have asked the President to sign their red trucker hats "Make America Great Again". But that is exactly what a considerable part of the news media has done. For example, television anchor Soledad O'Brien claimed the visit, claiming that Trump and the First Lady had gone to Iraq only because of pressure. "It seems he's going to be ashamed," she wrote, explaining somewhat nonsensically later, "President … was preparing for this trip a few weeks ago, and the shame seems to have worked." The Washington Post's coverage of the President's visit has spent almost as much time cataloging various loosely related criticisms of the White House as the details of the actual visit. NBC News released an untrue story Tuesday evening titled, "Trump is the first president since 2002 to not visit troops at Christmas time." The news giants could be forgiven for having done something wrong. However, it can not be forgiven that the story remains even after the facts become known. NBC updated its headline and added a detailed note from the editor that relied heavily on the defense that technically failed Trump on Christmas day. Christmas, as most people know, lasts until the Epiphany on January 6th. In the note of the grumpy and derogatory editor states: "At the end of Christmas Day 2018 Trump had visited during the holiday season no troops and no plans announced do you. The article was correct, but on 26th December the situation changed. Other newsrooms plunged into scandal over the fact that the president signed MAGA hats for certain military personnel. 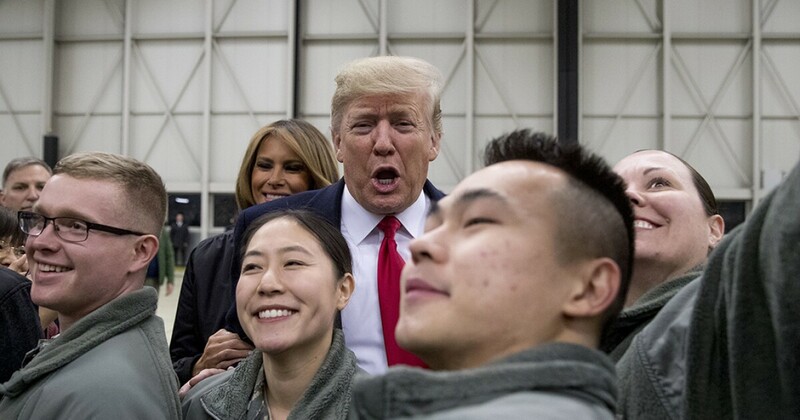 After Trump's visit, the reporters said that members of the armed forces who had sought or accepted Trump's autograph had violated various military regulations by participating in "partisan political activities." The press explains why you should be disciplined. To be fair, not everyone in the press used the president's visit as extra ammunition for their attacks on the White House. Contrary to the widespread, sneering, scornful and complacent words, Chris Cuomo of CNN congratulated on where this was earned. "Good move for Potus – seeing troops in Iraq after Christmas," the newscaster tweeted on December 26th. "Yes, this potus has been waiting the longest, but he did it. And it means a lot for the troops. Keep it positive and know about it – potus will receive positive coverage. " Good action for potus – seeing troops in Iraq after Christmas. Yes, this potus has been waiting the longest, but he did. And it means a lot for the troops. Keeping positive and talking about it – Potus will receive positive coverage. Unsurprisingly, Cuomo was rehearsed in social media shortly after the president's praise. Because that's exactly what happened in the era of #Resisting. To say that Trump did something decent is an act of apostasy. It is mercilessly punished by true believers. Maybe the newsrooms are so reluctant to give Trump where it's due. The press should hear their own criticism from the president and learn a little propriety.